When we established our company in 1997, we were a stand alone Tool shop with a few sample presses to qualify the Molds. 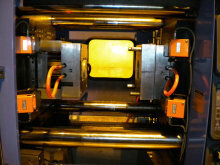 We built Molds for many large OEM's and Custom Injection Molders. Knowing that the quality of the product starts within the tool, some of our OEM customers that we were doing R&D work for, turned our sample presses into short run production and onto high volume of their molded parts. Future Mold Inc. is a Custom Injection Molder with a complete computer aided Tool Shop. We are located in Southern Indiana and were established in 1997 specializing in: Part design, Prototype and Production Injection mold Tooling, Short run production Injection Molding and high volume production Injection Molding. We take pride in supplying a quality product at a competitive price, with an on time delivery. Future Mold Inc. can take a concept idea and produce a quality product from the design stages thru the full production process.